My backyard is asparkle with them. This was a fun shot to make. The photo makes it appear as if all of the fireflies are lit at the same time. In actuality, I set up a long, tripod-mounted exposure, and individual fireflies may have been represented multiple times. 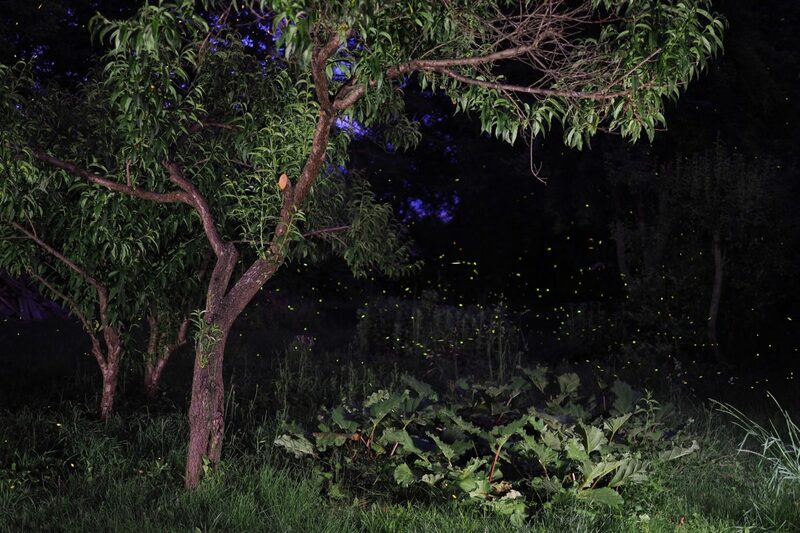 In order to illuminate the peach trees and the rhubarb patch in the foreground, I walked around the perimeter of the scene with a flashlight while the camera’s shutter was open, reflecting diffuse light off a lawn chair turned on its side. I had to take a few shots to get the exposure just right. This one took about a minute and a half, as I recall. I love the unexpected results of this kind of shot—it reminds me to appreciate the photography of yore, when long exposures were necessary under even the brightest conditions, and a degree of uncertainty was the norm. I’m sure that some of the fireflies appear in the photo not because of their own phosphorescence, but because they are being lit from the side by my flashlight. The glowing effect is magical nonetheless, and hopefully it captures the spirit of an early summer evening.